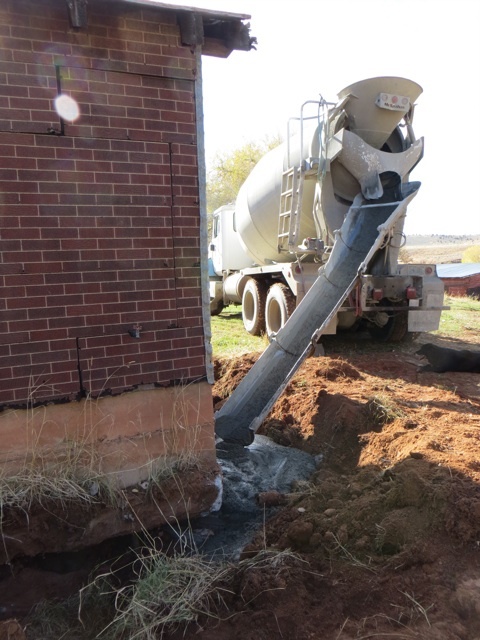 We poured a little concrete today. Vernon and a local contractor jacked up the corner of the old welding shop that had fallen about a foot and a half. Remember me trying to find a flat area to weld my creations? Well, it’s repaired to some extent. This was just runny concrete… no aggregate (gravel) in the mix, just sand. That helped ooze it up under the slab, so that the entire shop doesn’t fall in on my head next time I feel like welding… or Brandon makes some creation with his plasma cam! There was a smidge of leftover, so it was poured for fill in my studio. I have half a floor in one part! I’ll get more “real” concrete over the top of this, but for now… it’s halfway exciting. October 12, 2008 No entry.